I can remember when our search for a preschool began. We had a list of reasonable requirements, but we were willing to make compromises. We toured many facilities and labored over a decision. Finally, we made a choice and enrolled our daughter, who is now 9. Looking back on her first year of preschool, I can now say that I was never totally satisfied with our choice of preschools that year. There were several reasons for my regret. It was a combination of my high expectations and not being able to find exactly what we were searching for. If I could have only created my own preschool and daycare center...It would have been perfect! Today that's possible thanks to Kiddie Academy Child Care Learning Centers. Kiddie Academy has been providing educationally focused daycare for over 30 years. Currently, Kiddie Academy is expanding throughout New Jersey and is looking for passionate individuals and/or couples to open franchises in the Garden State. Looking to grow professionally while still being able to have personal time to enjoy your favorite activities? Do you want to set your own schedule? If so, becoming a Kiddie Academy franchisee is perfect for you. If you have an entrepreneurial spirit with a desire to run your own business, Kiddie Academy is looking for you to become a franchisee. Kiddie Academy is committed to the success of each individual franchise and will support each franchisee to meet their strategic growth goals and to ensure success. 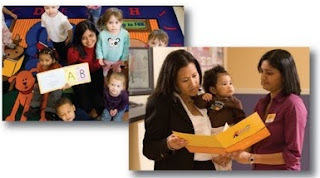 Pieces of a Mom will be featuring Kiddie Academy franchise success stories through the end of March. In the meantime, for more information on this wonderful opportunity, visit the Kiddie Academy Franchise Website.